This mist is my new BFF at the moment! Paul and Joe Beaute, have yet again produced a product that I will not be able to live without! Basically. the rosy mist hydrates the skin without making it dripping wet or sticky – fab! It take two seconds to press the pump and release the organic jojoba infused water on to the face/body/hair/clothes. It provides a cloud of floral scent that lingers on the skin way after you initially spray it. This Paul and Joe creation is just the ticket for holidays in warm climates. or by your desk while you’re trying to work through the heat of the summer. Although it is also useful for any ladies/gents who are experiencing hot flushes, or burning legs/feet, to help them cool down. It’s a little ‘pick-me-up’ for the skin and also for one’s emotional well-being. The fragrant mist gives you a moment of clarity, in the hubbub of daily life! Once the skin has been sprayed, the mist gives a radiant glow to the complexion, and when sprayed on top of foundation, it gives a dewy glow. When sprayed on the hair, the locks become more glossy, and the aroma clings to the hair strands and lasts much longer than it does on the skin. The spray is £11.50 for 60ml, and it is more than worth it , as you really don’t need a lot to have a quick ‘pep’ up for the skin. Unfortunately, however, it contains five types of parabens : Butylparaben, Ethylparaben, Isobutylparaben, Methylparaben, Propylparaben. Such a prevalence of parabens seems unnecessary, especially when so many people are worried about using them. The result of using more than one paraben at a time is unknown, so that is certainly something to take into consideration before buying this product. I would also advise not to use this product around the armpit and surrounding areas, just to be safe. However, it is a great product, and without the paraben issue, it would have obviously scored higher! 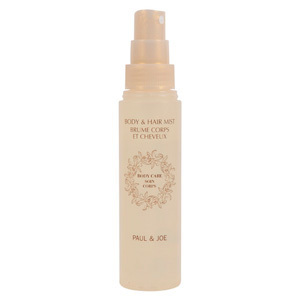 Buy your Paul & Joe Body & Hair Mist from Beauty Bay. 7 out of 10 lipsticks.